Thursday morning I worked at our local theater popping popcorn for a children’s movie for a group of school children. Later that afternoon I went to Spencer Elementary School to do my Real Men Read with Mrs. Lee’s kindergarten class. I left them with a treat bag of a gingerbread cookies (I read “The Gingerbread Man” to them), a candy cane, and a “3 Feet Please” bear. By the way: would you like to have one? I will be glad to send it to you if you will use it as a reminder to pray for me. Friday I had to take my truck in for service in Terre Haute (an hour away), which ended up taking much longer than they thought. That sort of threw us off our game a bit since we had to do some shopping for our Christmas breakfast, but we also knew Janna (our daughter), Jason and Braden were coming in to spend the weekend with us. Saturday I studied early, went to the Y with Jason and Janna, studied some more then met some folks at Abram Farm to set up. We had so many show up to help we were pretty much ready within an hour. We had our family Christmas Saturday night. Sunday I was up at the normal time to make my way to the office to study and prepare and to be at Abram Farm at 8:00. I’m not OC by any stretch but I did want things ready to go. We had a wonderful service! I think people were pleasantly surprised I was done earlier than I normally am. (They may protest in weeks to come for a return to Christmas!). 🙂 But the real surprise was I had planned on folks being back at 2:00 to put things away. Lo and behold, my early dismissal meant some could not get to their planned family reunion for at least an hour so they asked if there was anything they could do. They started putting chairs away and those standing around talking decided to help. When I left for lunch, everything was done! All I had to do was sweep (someone else did), pick up and load some of our own equipment and was gone by 3:00. That was fantastic because that evening we were heading to our local theater for a sold out showing of The Polar Express. Monday we had our traditional Christmas breakfast of Jo’s sausage gravy and biscuits, eggs, bacon and friendly banter. J, J & B left about noon and we headed up to the the church building to prepare for the church’s Christmas breakfast at the local Lion’s Club. Lots of moving and lifting and getting set up. Monday evening saw both Jo & me sort of collapse and not do much moving except to go to bed. Tuesday morning we were there at 4:30 so Jo could get started. (That’s not counting the 3:10 wake up of “Bill, I think I forgot to lock the LC. And I can’t find the key.” So I drove there (it was locked) and in the meantime she found the key on the kitchen table underneath stuff. WHEW!The breakfast went well. We had 25 deliveries to people; over 30 to service personnel (gas station workers, sheriff and police, etc). We had about 15-20 who came in to eat. Interestingly, I heard several say, “I came for the socialization.” Cool! We took all the leftover food to the local EMT folks. After cleaning up we went home. I spent some time doing my NMM, reading and then with a sunny 44+ degree day shining through my window I broached the “Is it okay if I go for a ride?” question. She must have been expecting it. She said, “Yes!” After 45 years together she still says, “Yes!” (I am blessed). So I was able to get in a 14.7 mile ride on a beautiful sunny day on Christmas Day. Who woulda thunk it? All of the above did truly happen. And all of it while fighting flu-like symptoms that stole my sleep. 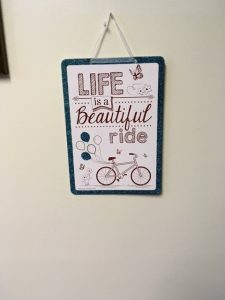 Except for the ride of course. You know THAT made me feel better. Well, sorry. This has got to be the l-o-n-g-e-s-t post I have written in a long time, maybe ever. Nothing earth-shattering. Just a whimsical look at my weekend. So…in a much shorter version…how was your Christmas weekend? The past few Decembers I have taken to posting something about Christmas. A song. A devotion I read. A quote. I plan to do that this month as well. My first post is by my favorite singer probably of all time. He made his mark with a group in the 60s and then went solo in the 70s and beyond. He put out a Christmas recording (what else should I call it?) back in 2008 and it stays close to my truck CD player for the whole month in December. One year it never left the player. 🙂 What’s funny is I have a compilation of his 40 greatest hits and the title tune from his CD is on it: “I Love Christmas.” When that song comes on it truly is Christmas in July. Anyway, in keeping with the real meaning and spirit of Christmas, I’d like to feature what I consider one of the highlights of the CD. Hope you enjoy it. And Floyd: you know I had to do this. In fact, I included this just for you! Once a month I read to Mrs. Lee’s Kindergarten class for what is called Real Men Read. There are a number of men in Owen County and Monroe County (and perhaps others) who go into a class to read to kindergarten students. This is my 3rd year now for taking part and I honestly believe that I receive more than the students do. Mrs. Lee does a wonderful job with the children and has them prepared for my visit. After the first year I requested the children wear name tags so I can call them by name. She willingly obliged. But that is not why I am writing this post…although Mrs. Lee and her assistant deserve a lot of praise. It was the book I just read that I want to write about. 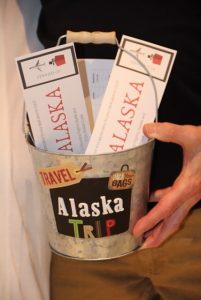 The name of the book was How Full is Your Bucket? It was a delightful book about a young boy named Felix whose grandfather told him that everyone has a bucket. For every kind word said to them, a drop of water goes into their bucket. For any kind thing they say or do for someone else, water drops into their bucket but also into the one who gives the compliment. It works sort of like the old “change in the pocket” idea. One day Felix was having a bad day and his bucket was about empty. His sister was not nice. He reached for and dropped a box of cereal. His mother yelled at him. A school bully was mean. He was wiped out. Then came a class where the teacher praised him for his essay. A drop of water went into his bucket. The class loved his story-laughing and clapping when it was done. More water. Another student said something nice to him. Drop. Soon Felix was complimenting people and putting water in their bucket, but also in his. He came home with a full bucket. He even put water in his sister’s bucket by letting her build a tower out of his blocks. The implications should be easy to see. Just one from me: encouragement goes a long way. Not only do we brighten someone else’s day, but we shine some light on our own. While we are putting drops of water in another’s bucket, we are also adding to our own. How much do you add to someone’s bucket? Okay…so I posted a picture of my office on Monday morning after the young people were done. You can see it here. Diana took Monday off because her son was married on Saturday (and no she was not in mourning). In actuality, not only was she tired from the affairs of the wedding, she and Jim celebrated their 29th anniversary on Sunday so I told her to take Monday off. 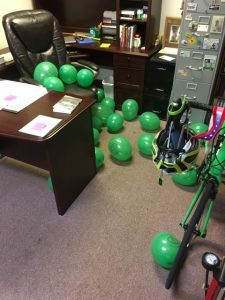 When she got here Tuesday morning someone (but I won’t mention Ryan’s name) took the balloons and put them in her office. I should have gotten a picture but failed to. Diana should have been mature enough to stop it but no-o-o-o-o-o-o. What can you expect from a 40 something year old lady? Children! She actually took some time to do this because when I may or may not taken the balloons to Ryan’s office, they may have wanted to cling to whomever did the dastardly deed. So I did what any mature individual would do the next morning…no I didn’t take them back to Ryan’s office…I took my knife and busted all 25 of them. Such maturity and restraint shown don’t you think? However, it was a pain to clean up all the balloon pieces which flew everywhere. But there is something good here. Since you are here I’ll take you on a partial tour of my office. At the very top are two puzzles of Titanic I had framed, and display of Titanic books. To the left is my set of the ESV Reader’s Bible. 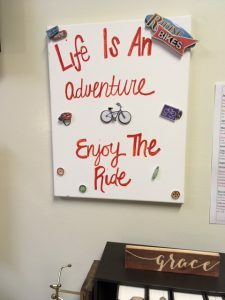 Above that is a canvas sign given by Janna which says, “Life is an Adventure…Enjoy the Ride.” To the right of it and hidden by something is a picture from several years ago of Braden, me and Optimus Prime we had taken at Pigeon Forge. Just above my desk chair is a card from Jo which she gave me on Valentine’s Day (one of my favorites from her) and to the right of that is a card I put into a frame of George Bailey and his family with “Bill Grandi…the Richest Man in Town” inscribed on it. To the right are some tricks of my trade: books, Study Bibles, and some note cards. On top is a display of bicycles people have given me. 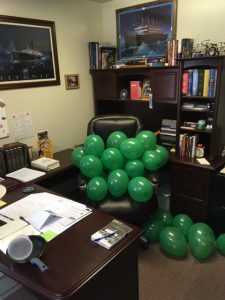 And in case you read the previous post: Ryan did not inspire the young people to decorate my office with balloons. I got the confession out of Hope. She’s a lousy liar so I simply had to ask and all she said was, “I may or may not have.” Guilty!! Today is Thursday as I write this. I am finally finding time to do this. Hope your week has been a good one and filled with mischief, good things, laughable moments, (fill in the blank). There were actually more under my desk and behind my chair. All told there were probably 20-24 balloons just laying around in my office. Somehow I think the Great Instigator aka former Youth Pastor or Youth Pastor’s wife allowed the teens to go into my office. Actually, I leave my door open during the day so he wouldn’t have had to let them in but I’m suspecting he or his wife may have been behind it. I was excited though. 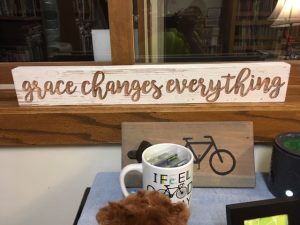 It actually went with my office decor i.e. Hi-viz lime green bicycle sitting in my office. (I leave from the office during my lunchtime ride so I just leave my bike here). Ryan & Hope do a superb job with the kids (all ages). They love them unconditionally. They listen to them. They laugh with them. They go places with them. Ryan visits them at school during lunch time. They even get into trouble with them. AHEM! But he is also teaching them a servant’s heart. This week they are on Fall Break and two of the days will be spent serving. Wednesday is an all-day event at IDES in Indianapolis. They will be paying for and packing meals for disaster relief. They have a little fun afterwards by going to some climbing wall and adventure place. Friday they will be serving in the community after working some around the church building. Ryan and Hope have servant’s hearts and I’m glad to see they are trying to teach and instill that in our teens. And what better song for this occasion can there be than this one? Trust me though when I say it was not one of my favorites as a teenager.